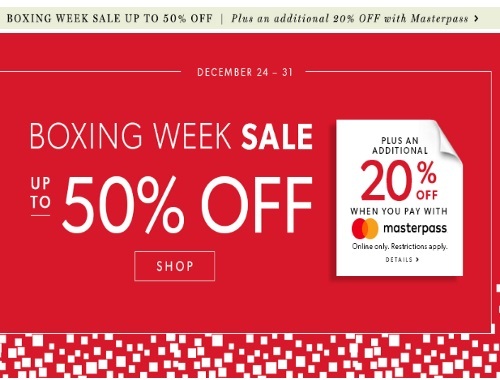 Chapters Indigo's Boxing Week Sale is on now! Save up to 50% off throughout the store! Plus save an additional 20% off when you pay using MasterPass. The extra savings will not show up in your cart but will automatically reflect during the final stage of your checkout once you sign in via MasterPass. The 20% discount automatically applies at checkout when choosing MasterPass as your payment method. There is a limit of one use per customer. Please note eBooks, Apple products and accessories, gift cards, American Girl (except Wellie Wishers), iRewards memberships, Love of Reading products and donations are excluded. Offers are valid December 24-31, 2016.